Looking for a mini dessert loaded with sweetness and flavor? 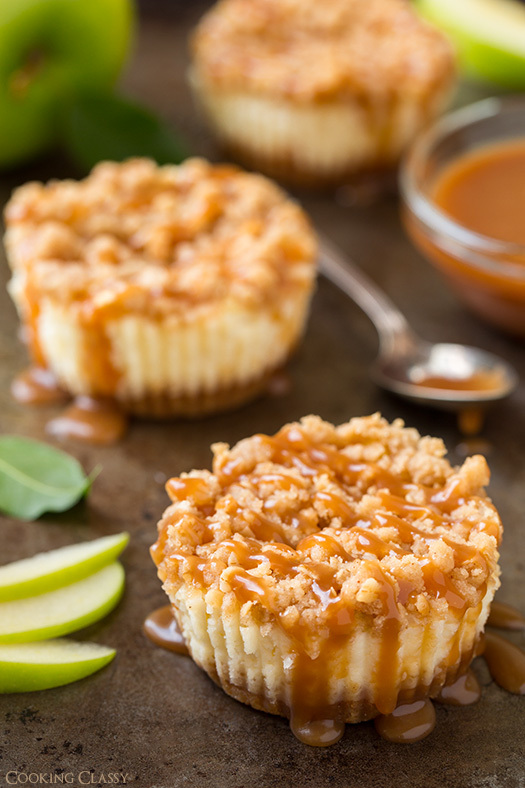 Look no further than Cooking Classy’s for Caramel Apple Mini Cheesecakes with Streusel Topping. Try this recipe with 8 trays of Dippin’ Stix Sliced Apples with Caramel. Preheat oven to 325 degrees. In a mixing bowl, whisk together graham cracker crumbs, sugar and cinnamon. Pour in butter and using a fork, stir until evenly moistened. Divide mixture among 18 paper lined muffin cups, adding a rounded tablespoon to each cup. Press into an even layer. Bake in preheated oven 5 minutes, then remove from oven and allow to cool. In a mixing bowl, whisk together flour, quick oats, brown sugar, cinnamon, nutmeg and salt. Add cold butter and using fingertips, rub butter into dry mixture until it comes together it small crumbles and pieces of butter are no longer visible. Transfer to refrigerator while preparing apples and filling. In a bowl, toss chopped apples with lemon juice, set aside. In a mixing bowl, using an electric hand mixer set on medium-low speed, cream together cream cheese with sugar just until smooth. Mix in eggs one at a time, then blend in sour cream and vanilla. Divide cheesecake batter evenly among 18 muffin cups pouring filing over crust (I used a 1/4 cup and filled it about 3/4 full). Divide apples evenly over cheesecake layer, then finish by sprinkling a heaping tablespoon of the streusel over tops. Bake in preheated oven 23 – 25 minutes. Cool at room temperature 30 minutes, then transfer to fridge and chill 3 hours. Serve with caramel sauce. *This is about 3 small granny smith apples. I recommend chopping very small so they can cook all the way through, almost mincing them (even smaller than that pictured because mine weren’t quite tender all the way through).